A neuroscientist who runs her own lab in the Department of Integrative Biology and Physiology at UCLA, Phelps was invited to participate in the Amgen Scholars Program from day one. She remembers Judi Smith, Dean and Vice Provost of undergraduate education, explaining to her that she thought it was critical for a faculty member to participate in the UCLA program together with a program advisor. Phelps was intrigued by the Program, as UCLA had few summer opportunities for undergraduates at the time, and she had a lot of respect for Amgen; she took the position without hesitation. “So, I had the good fortune to be the first faculty advisor and to work side-by-side with Tama Hasson, who is also a faculty member but is entirely devoted to undergraduate research,” she says. In her time with the Amgen Scholar Program, she has not only mentored students and helped with the application process but she also has taken a leading role in the U.S. summer symposium held at UCLA – thus helping to shape the Amgen Scholars experience for all students in the United States. In the early days of the symposium, the different program directors would lead round tables with the students. Phelps had the idea to bring in faculty members in different research areas and to then cluster the students together by research area – hence was born the research round tables. 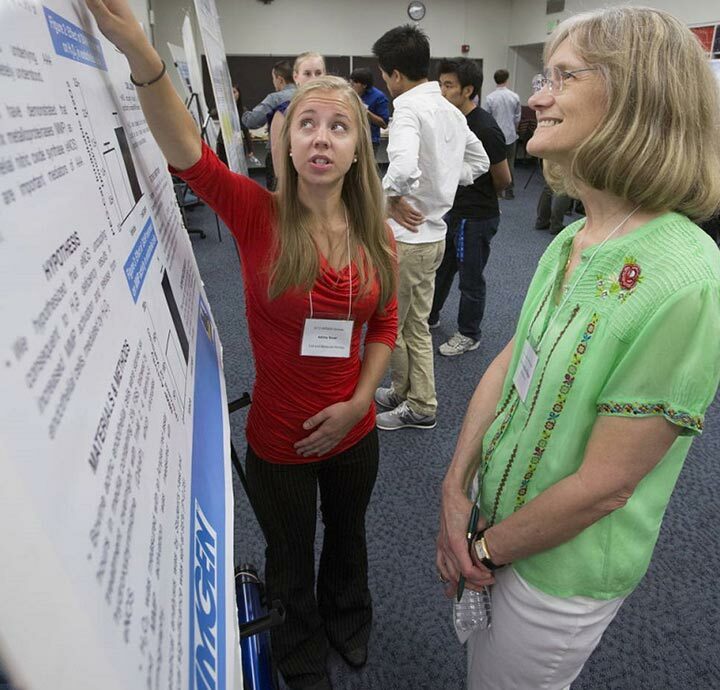 “The students really enjoy talking about their research projects with their peers and a faculty member in their field,” she says. In her time with so many Amgen Scholars, she realized that one of the most important things she can offer is to listen. While many students know immediately what path they want to take, others are not sure, so Phelps tries to listen and guide them through their options. “Too many students believe that there’s only one career that will make them happy – being a physician – but it’s important for them to be open and to appreciate other opportunities,” Phelps says. Phelps knows this from personal experience. In her own career, she started as an occupational therapist, working in hand rehabilitation at Washington University in St. Louis. After being in the field for 6 years, she realized that she needed more of a research basis for her work. She eventually wound up in Los Angeles where she pursued neuroscience in graduate school. Her lab now focuses primarily on spinal cord injuries and treatments to facilitate axon regeneration. Her work involves transplanting glial cells from the olfactory system – laborious experiments that could one day translate to clinical settings. Over the years, she has had two Amgen Scholars work in her lab, one who has completed his Ph.D. and works in industry and the other whom is now pursuing a MD/Ph.D. at University of Michigan. The experience helped her further appreciate how much is asked of faculty and how important it is for students to have a good lab mentor. As she leaves the Amgen Scholars Program, Phelps is looking forward to focusing more on experiments in her lab and is excited to pass the faculty advisor baton to Beth Lazazzera. “Beth is a terrific faculty member with deep experience in undergraduate research and education,” Phelps says. She looks forward to getting the call from Lazazerra to participate in next year’s U.S. symposium round tables. And Phelps hopes to continue seeing the many successes from the scholars she’s mentored over the past 12 years.